Hey There! It's Kim from the Fotobella Design Team. 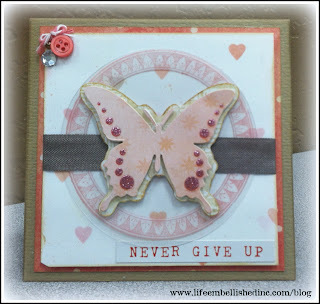 I have been working with the Hello Friend collection double page layout kit by Glitz Designs from Fotobella.com. I was amazed at how much product is included with the kit! I was able to complete a double page layout & still plenty of stuff left over. Each kit includes: beautifully printed double-sided papers from the collection, layered stickers, title stickers, paper layers, peek-a-boos, paper garland & washi tape (my favorite). One of my freinds was recently diagnosed with breast cancer. I wanted to make a quick card for her to let her know that I will be here to support her through her treatment and recovery but also give her a few words of encouragemnt during this difficult time. The beautiful shades of pink and coral were perfect! To complete the card, you will need to purchase the kit from Fotobella.com. Labels: Fotobella, Glitz Designs, Hello Friend, Kim McMahon-Rosenberger, Life Embellished Inc.